About a week ago I decided to treat myself to something really nice so I stopped by Macy’s on State Street in downtown Chicago and headed straight to the Carol’s Daughter counter (Hey, I work hard, I deserve it! LOL). I had heard many great things about the brand which is at the forefront of the transition natural movement and uses top of the line natural products in its hair and skin care products. 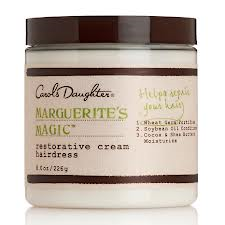 After looking at a few items I settled on Marguerite’s Magic Restorative Cream Hairdress. The product is designed to “undo the most intense damage caused by styling or chemical processes”. It doesn’t contain petroleum, mineral oil, parabens or artificial colors which is a plus for my natural hair. It contains wheat germ oil, which is said to aid in promoting hair growth, as well as soybean oil, Shea and cocoa butters along with an assortment of other natural oils. The heavy stiff white cream feels slightly moist to the touch but doesn’t make you hair feel damp or weighed down. My hair had a light sheen and a pleasant scent after I applied the product. After using the product for one I can’t say that I’ve noticed any growth, but as a result of using Marguerite's Magic Restorative Cream Hairdress my hair is more manageable and soft to the touch. Carol’s Daughter Marguerite’s Magic Restorative Cream Hairdress is so on point. This hairdress will be your tresses in check. I really like how it moistures my new growth with bounce and volume. Just give a try, you will not regret.